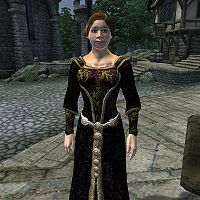 Casta Scribonia is an Imperial savant and the author of several popular books (none of which appear to be in the game). Her home is near the Chapel of Stendarr, and she can sometimes be found visiting the local Mages Guild hall. She is sometimes visited by another author, Quill-Weave, from Anvil. Casta Scribonia begins her day after getting out of bed at 6am, at which point she will wander around her home for the next two hours. Once two hours have passed by exploring her home, she will leave her house and head to the Southern Gate and chat with passers by for the next four hours. At noon, she will seek out Orok gro-Ghoth for a meeting. After speaking with Orok, Casta Scribonia will return home at 2pm. She will continue exploring her home for another two hours, after which she will visit the local Mages Guild to see Contumeliorus Florius. After visiting Contumeliorus, she will head to The Oak and Crosier for dinner. After her meal, she will return home for the day around 8pm, where she will continue her earlier task of exploring her residence. Finally, she will retire to her bed at midnight, where she will sleep until 6am to repeat her schedule. She wears a black & burgundy outfit with a pair of green velvet shoes. She also carries a modest amount of gold, a pair of green silk garments and her key. When encountered for the first time, Casta will boast about one of her books: "Hello. I'm Casta Scribonia. The writer. Author of 'Woman Gone Wild'." She is also something of a match-maker. When asked about Chorrol, she will at first respond "Who is the fairest of them all? Other than myself? The proprietor of the Grey Mare is lovely. She and the guard captain would be a nice couple....", but after the mini-quest involving Emfrid and Bittneld the Curse-Bringer is completed she will say instead "I hear that Emfrid and Captain Bittneld are spending a lot of time together. You wouldn't have anything to do with that, would you?" Her fame as an author is widespread but people have a mixed opinion of her work: "Casta Scribonia has finished a new book. Nothing that interests me, though", "I read one of Casta Scribonia's books not long ago. Terrible stuff, if you ask me. But, some folks seem to like it", "I've liked some of Scribonia's work. Haven't read everything, though", and "I'd like to read Scribonia's work. I just wish I had more time to do it" are the one-line reviews that can be overheard. Another, longer, review of her work can be found in Alessia Ottus' Guide to Chorrol. Bittneld and Emfrid: Help to bring two lonely hearts together (non-journal). Casta is the owner of the other chestnut horse in the city stables, although she never uses it. Casta is supposed to visit Orag gra-Bargol at noon instead of Orok, who she was supposed to meet at 2pm. Likewise she is supposed to go to Renoit's Books at 6pm instead of The Oak and Crosier, which she should have visited at 8pm. Esta página foi modificada pela última vez à(s) 23h04min de 3 de abril de 2015.